Review the online workplace guide (PDF file). Print and display the posters a week or two prior to the event. Use the “uniqueURL” provided in the workplace admin page to direct co-workers to your custom workplace registration page. Encourage everyone to log their healthier commuter choices that include walking, cycling, public transit, carpool and teleworking. If employees do not have access to the internet, collect commuter data from employees and submit it on ‘bulk entry’ form on your admin page. Attend the local events in your city! Join our Facebook community to connect with other participating workplaces, keep informed about Commuter Challenge events, and learn more about active and healthy transportation. Have a look at our inspiration file with great examples of employee engagement in previous years. 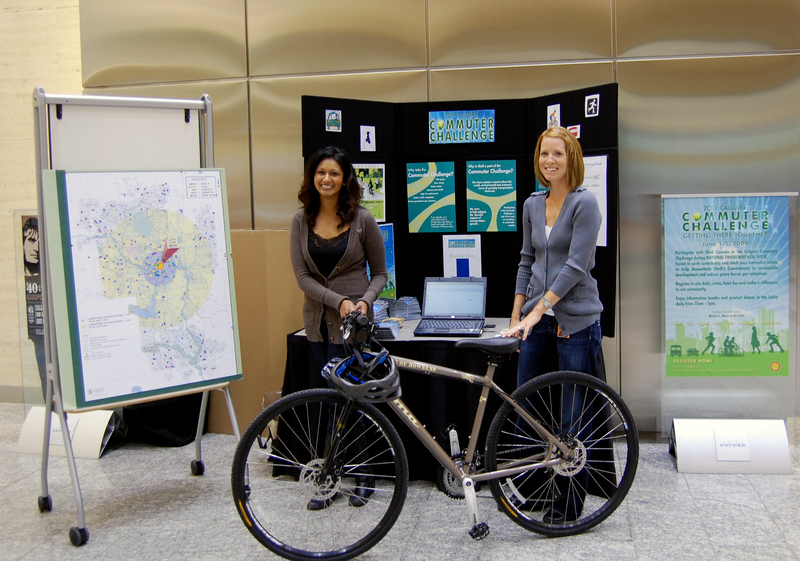 Set up lobby displays with information on workplace events, local transit connections, bike maps, etc. Reward outstanding commuters that can easily be identified through the detailed commuter reports available to you as a Commuter Challenge administrator.